Starring: Brooke Satchwell, Luke Joslyn, Adam Dunn, Nick Simpson-Deeks, Darcy Brown, James Marlowe. Staged at the Roslyn Packer Theatre, Hickson Rd. Nefarious, precarious, hilarious. That, in a few words, sums up the two acts of madcap magic that make up The Play That Goes Wrong. Yes. It is a play that does go wrong, even before it starts. Murder and mayhem mix it with missing props, misplaced feet, missed cues, mispronunciation and mountains of mishaps, malfeasance and misprision in a zany mystery that seems to take the mickey out of The Mousetrap (Agatha Christie’s, not William Shakespeare’s) and, in parts, is redolent of Michael Frayn’s Noises Off – or perhaps its play-within-the-play, Nothing On. In The Play That Goes Wrong, the Cornley Polytechnic Drama Society is staging The Murder at Haversham Manor, which, like The Mousetrap, begins with a murder. In Christie’s play, set in Monkswell Manor, the murder is reported on radio. In The Murder at Haversham Manor the villainy takes place in the manor. Both plays are set during a period of heavy snowfall. Both contain their action mostly in the main hall (with some ultimately hysterical exceptions). And both have twists that somehow involve a mysterious police officer, Sergeant Trotter in The Mousetrap and Inspector Carter in The Murder at Haversham Manor. Red herrings and comedy abound as the survivors – and the audience – strive to find the culprit or culprits as the stage, cast and play suffer a plethora of misfortunes which really need to be seen to be appreciated. It is funny stuff, belly laugh farce that has the audience in fits. And has been doing so for more than two years on the West End, where it won the 2015 Laurence Olivier Award for Best New Comedy. How good is it? Well, it could probably benefit from a cut of a few minutes. 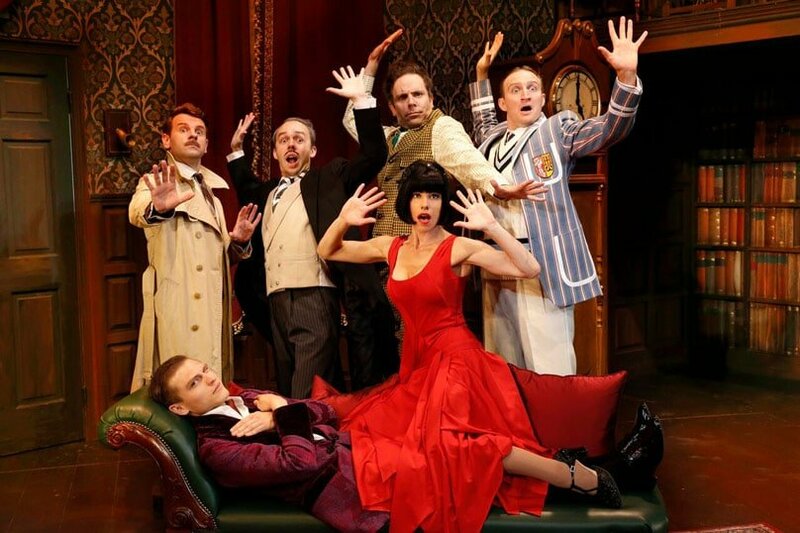 But, hey, patrons have been beating such a path to the box office to buy tickets that The Play That Goes Wrong will be back at the Roslyn Packer for a return season from 16-21 May. That’s a pretty good guide. PS: The souvenir program is a gem, too. John Pierce has been a theatre critic for many years; he is a former convener of the Sydney Theatre Critics Circle and former theatre, opera and dance reviewer for The Daily Telegraph.